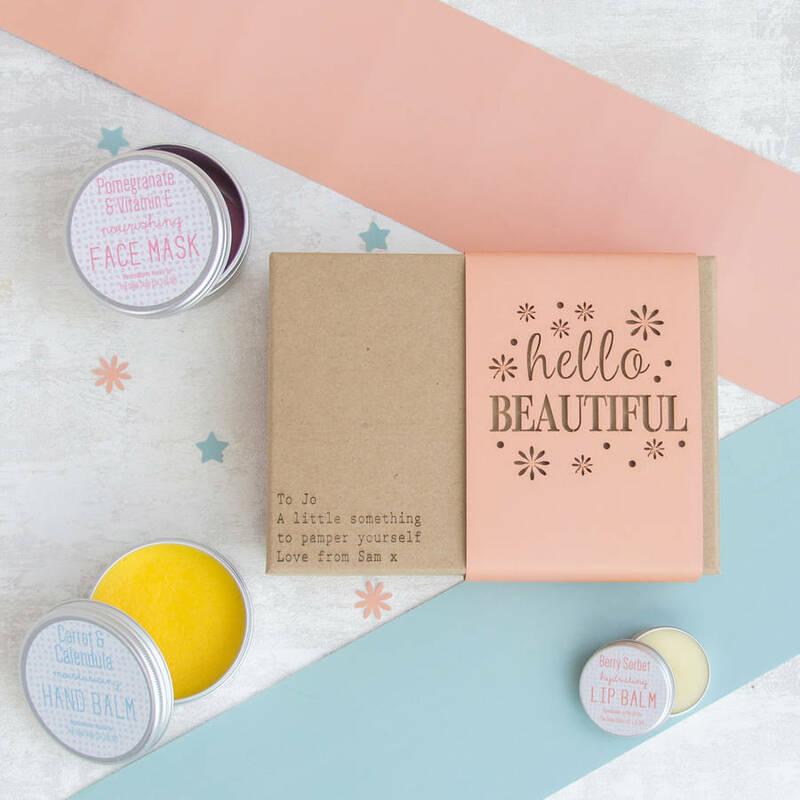 A personalised 'Hello Beautiful' pamper set, containing lip balm, face mask and hand balm. 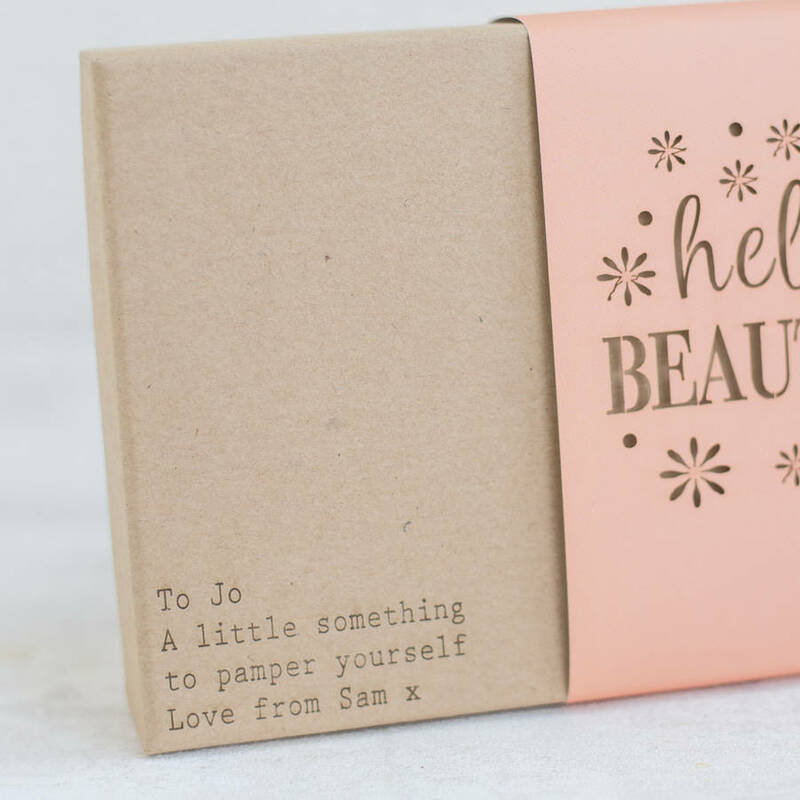 Packaged in a gorgeous box and personalised with your special message this 'Hello Beautiful' pamper gift box is sure to delight. 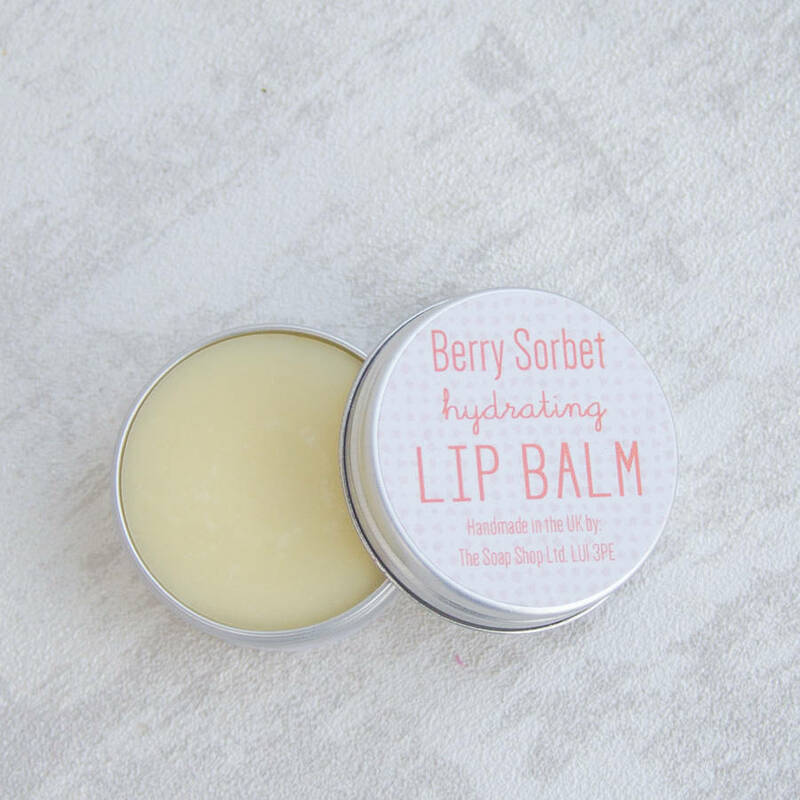 Berry sorbet lip balm, a vibrant fruity accord of juicy blueberry accompanied by blackcurrant, strawberry, raspberry, grape and plum, leading to mandarin, orange blossom and a lemon kick on a base of vanilla. 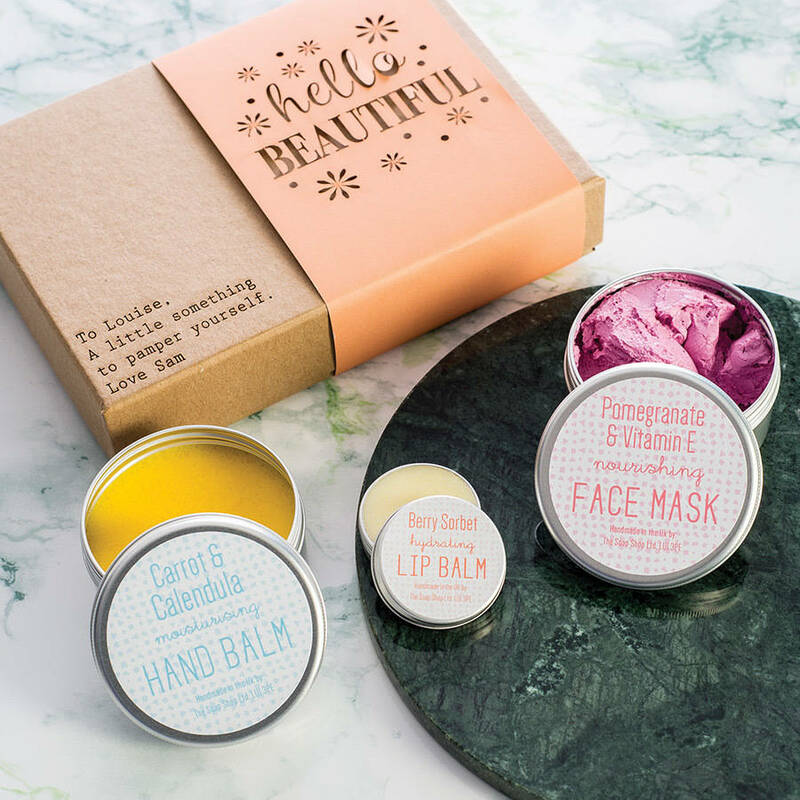 Made with organic Beeswax, Avocado Oil and nourishing Butters, it will instantly hydrate the lips without feeling greasy and protect them for hours! 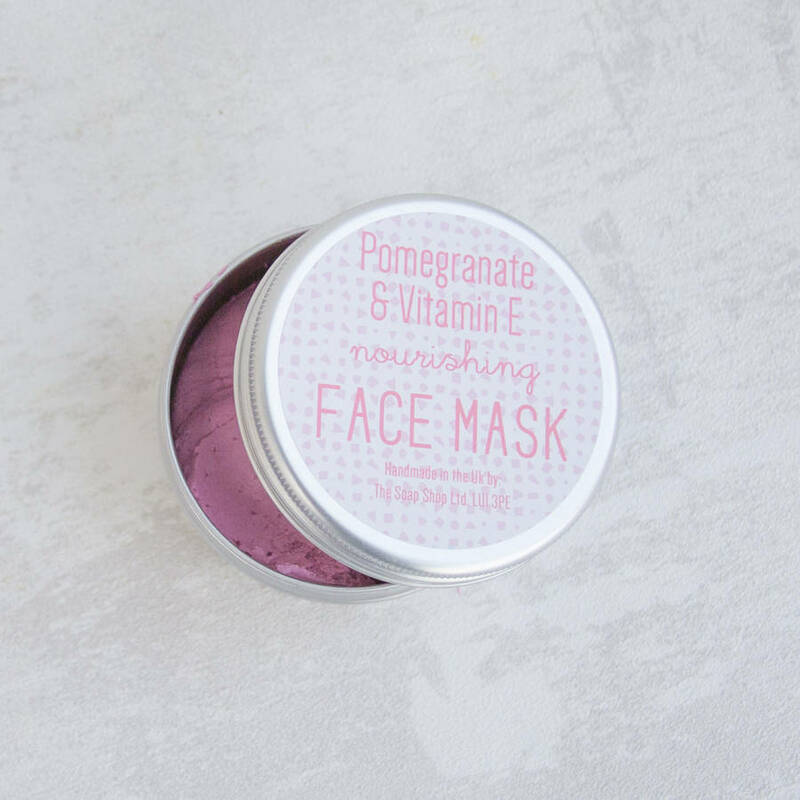 Face Mask: A refreshing, nourishing and cleansing kaolin clay mask, made with fresh pomegranate juice and vitamin E. This sweetly scented face mask will cleanse pores and remove everyday dirt and grime whilst nourishing the skin with it's fruity goodness. It contains a touch of Shea butter and Argan oil to leave the skin wonderfully soft after use.The perfect weekly skin treat. 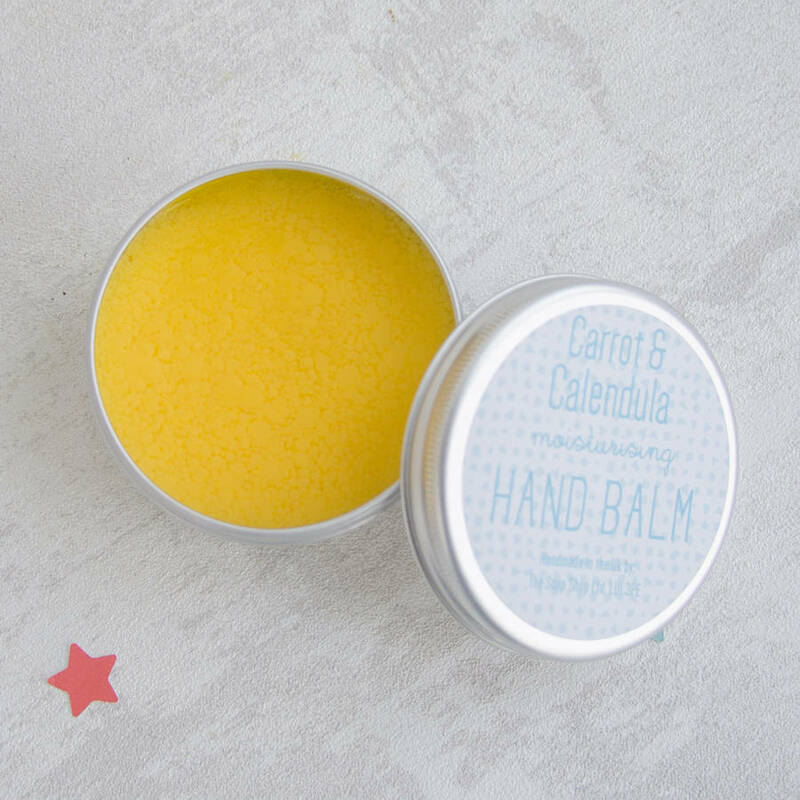 Carrot & Calendula Hand Balm. 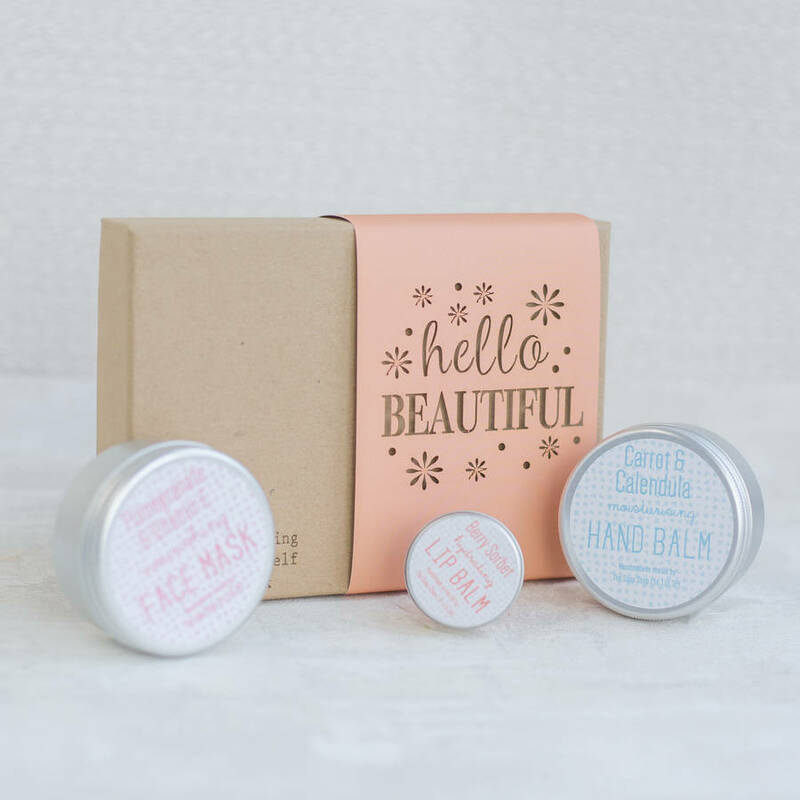 Apply this nourishing balm to dry hands that need real moisture. Made with Carrot and Calendula oils to deeply hydrate and Lavender essential oil to soothe and calm distressed skin. 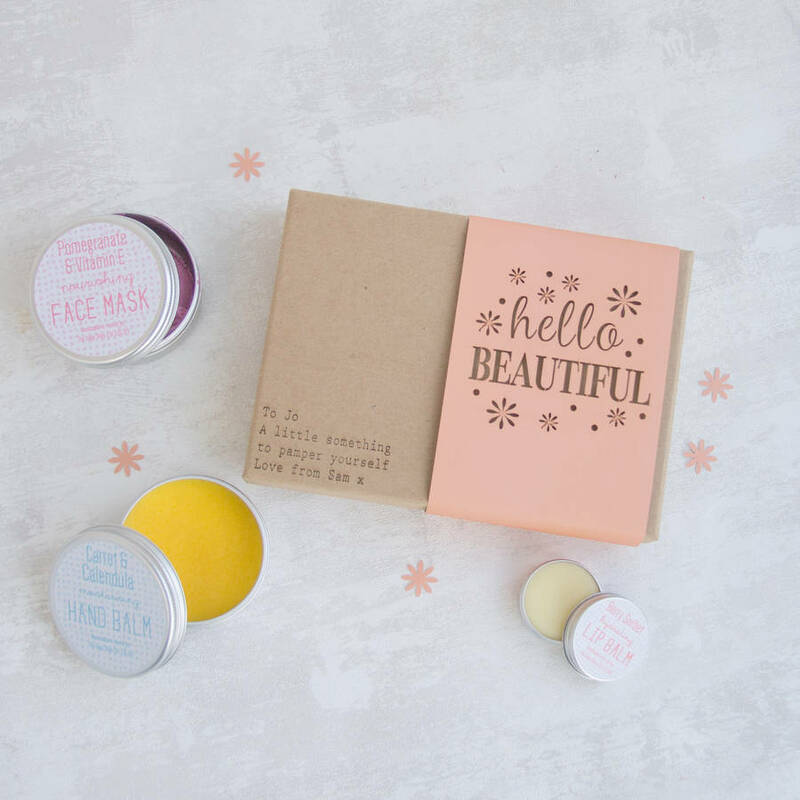 Beeswax, Cocoa and Shea butters will help to protect your skin from the elements. 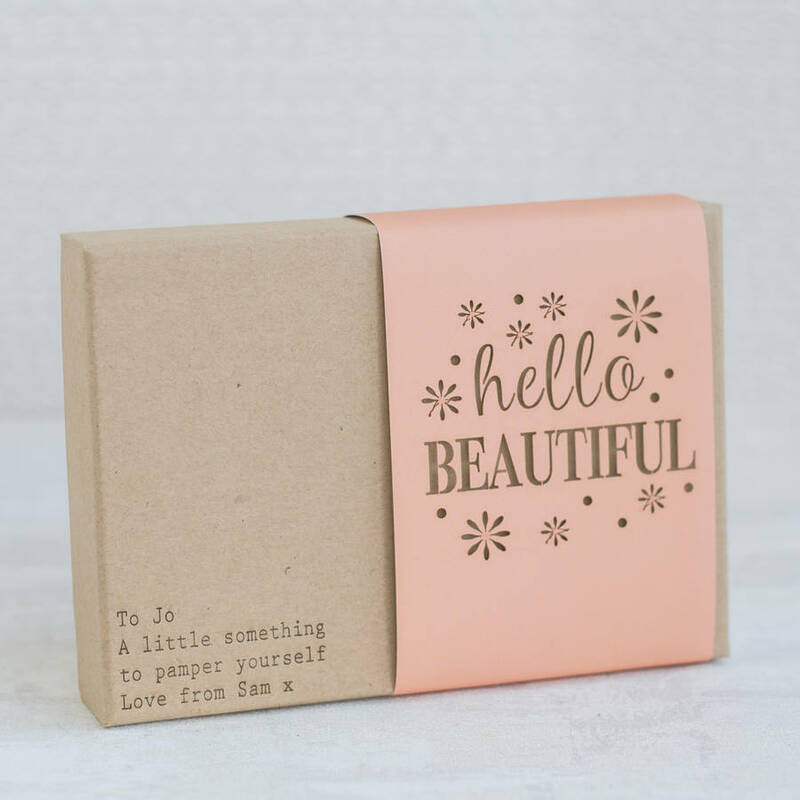 You can personalise the front of the gift box with who it is for, a special message and your name. DELIVERY: We use Royal Mail as our delivery provider, orders are sent first class, please note the delivery times stated are estimated. Berry Sorbet Lip balm; Prunus Dulcis (Almond) Oil, Butyrospermum Parkii (Shea) Butter, Cera Alba (Beeswax), Theobroma Cacao (Cocoa) Seed butter, Persea Gratissima (Avacado) Oil, Flavour, Geraniol, Linalool, Citronellol, Citral, Limonene. Pomegranate Face Mask: Aqua, Kaolin, Glycerin, Coco-Glucoside, Bentonite, Prunus Amygdalus Dulcis (Sweet Almond) Oil, Butyrospermum Parkii (Shea) Butter, Argania Spinosa (Argan) Kernal Oil, Cetearyl Alcohol, Parfum, Coconut Alcohol, Glyceryl Stearate, Punica Granatum ( Pomegranate) Fruit Juice, Helianthus Annuus, (Sunflower) Seed Oil, Dehydroacetic Acid, Disodium EDTA, Tocopherol, Benzyl Alcohol, Potassium Sorbate, C1 17200. 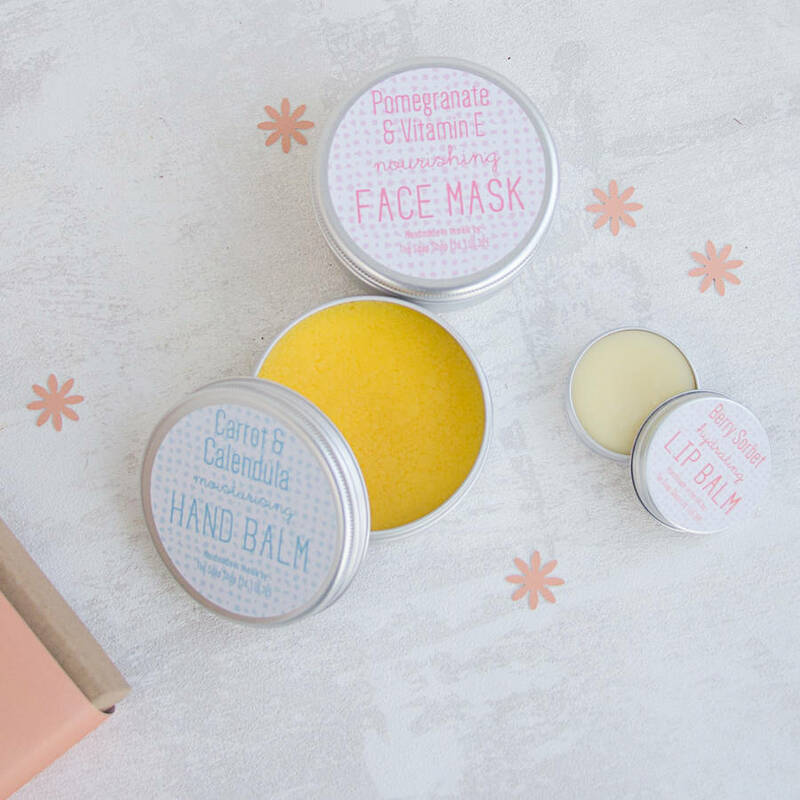 Carrot Hand Balm: Butyrospermum Parkii (Shea) Butter, Theobroma Cacao (Cocoa) Seed Butter, Prunus Amygdalus Dulcis (Sweet Almond) Oil, Daucus Carota Sativa Oil, Calendula Officinalis (Marigold) Flower OIl, Simmondsia Chinensis (Jojoba) Seed Oil, Lavandula Angustifolia (Lavender) Oil, Beeswax, Linalool, Geraniol, Limonene. This product is dispatched to you by Fora Creative.